Trees are essential to human existence. They supply the oxygen human beings need to breath and love. The bark is the outside layer of a tree that protects it and ensure its survival. The bark helps move vital nutrients and mineral from the root system of the tree all throughout. Tree bark also protects the network of pathways called the xylem and phloem that is comparable in function to the circulatory system of human beings. Any damage to the bark can cause the tree to grow very sick from insect infestation or even worse it can cause death. 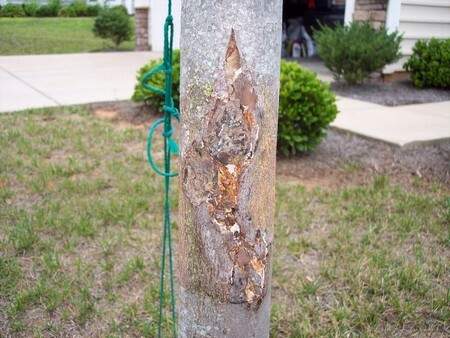 If you have an injured tree you want to help fix, then here is how you can repair a damaged tree bark on your own. If the problem persists, please ask for professional assistance. Read on for more information below. Taking of the outside layer of bark from a tree can be harmful to the tree. It can hurt the tree and even eventually kill it. Removing the outer protection for the tree can make it vulnerable to insect infestation that can be lethal to the tree. It’s important to keep this in mind and to go into this project with knowledge about how to execute the removal of bark. After the bark is taken off the tree, make sure to strap the tree so it doesn’t die. When the bark has been taken off the tree, see if it is possible to locate the missing part. If you can not locate this missing piece advance to step 4. Attach the chipped piece of bark back to the tree with some duct tape. The whole damaged area should be covered with the duct tape. Make sure the fractured piece of bark is back in the proper place before taping it securely to the tree. Check the injured section of the tree every 24 hours. This will help you detect whether the tree is suffering from infection before it gets too far progressed. Cold temperature and rain can cause the tree to be sick. Wait for about 12 weeks before you remove the duct tape. Now, use a very sharp knife to slice an oval around the perimeter of the injured area. This is called a clean cut. When this done, the natural ability of the tree to heal itself is triggered. Check the area and look out for insects. Get rid of any insect you may see that may cause sickness in the tree. If your tree is not recovered in 14-21 days, find a professional to assist you.